David Ortiz knocked in the Red Sox' 10th run yesterday with a sacrifice fly. That excepted, he had a rather unproductive day, taking an 0-for-4 to fall to 1 for his last 20 (the one hit being his three-run, game-deciding double Friday). He's fanned seven times (six swinging) in those 20 at-bats and has walked twice (both intentionally) in his last 23 plate appearances. Yesterday, the man with the ice bags perpetually wrapped around some part of his body earned a one-inning break at the end of the Red Sox' 10-3 rout. 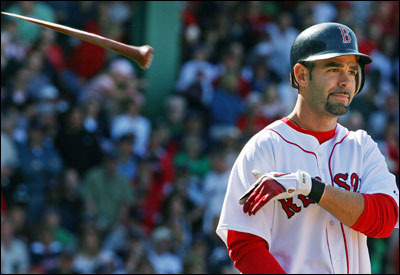 Jason Varitek, who thumped a grand slam against Kris Benson in the first inning, had earned the reward, as Doug Mirabelli came in to catch Manny Delcarmen in the ninth.